Dan Henderson (Pictured) has officially entered BJ Penn’s league. According to UFC president Dana White, once the time is right, Henderson will be inducted into the UFC Hall of Fame. White recently issued the same statement about Penn. While the 15-year mixed martial arts veteran owns an extensive 29-8 professional record, Henderson’s only accumulated a 6-2 mark inside the Octagon. He has never donned a UFC title and fell short in his both of his UFC championship affairs. The soon-to-be 42-year-old lost to Quinton “Rampage” Jackson for the light heavyweight crown at UFC 75, then was submitted by middleweight king Anderson Silva in his next outing at UFC 82. Henderson challenges reigning 205-pound champ Jon Jones next Saturday at UFC 151. Regardless of the outcome, White professes Henderson’s past accomplishments warrant entrance into the UFC’s exclusive club. “Whether Dan Henderson wins or loses, he’s a Hall of Famer,” White stated during Tuesday’s conference call. 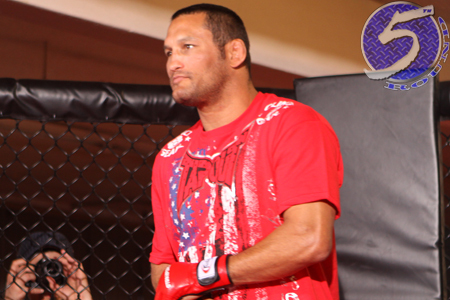 “Dan Henderson has been around forever. This guy fought Carlos Newton. He’s fought everyone at every weight class, he’ll always take a fight no matter what weight class. He’s never been knocked out, he’s a great wrestler, he’s got knockout power in both hands. Henderson, and ultimately Penn, will be joining the likes of Ken Shamrock, Royce Gracie, Dan Severn, Randy Couture, Mark Coleman, Chuck Liddell, Charles Lewis Jr., Matt Hughes and Tito Ortiz as members of the UFC’s Hall of Fame.